Filmmaker Lauren Knapp spent ten months in Ulaanbaatar, Mongolia, exploring its burgeoning rock scene and discovering the important role musicians play in giving voice to the newly independent nation’s cultural identity. After generations of Soviet rule, Mongolia gained its independence in 1991. The historically nomadic people were suddenly tasked with defining their new, modern identity, and carving out a place in a globalized world. With the end of Soviet oppression, decades’ worth of pop culture flooded into popular consciousness, as a world of previously inaccessible music opened up to Mongolians. The new accessibility of rock and roll provided the nation with a newly relevant voice for self-expression. 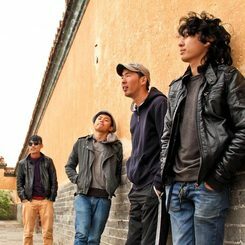 Live From UB assesses the current state of rock music in Ulaanbaatar (UB), Mongolia’s biggest city, through one of its most promising young bands. The film captures the spirit of Mongolian musicians and their desire to unify the music of independence with that of a long, rich tradition.